Carl has been an active member of the Club since November 2009. His club car is a 1933 Ford Cabriiolet. He also has a 1940 Ford Deluxe Coupe, which is in the process of being restored. For 2013-2014, Carl is the Club Secretary. Carl and Jan have been married for 43 years. They have three daughters, two sons and two grandchildren. Carl is a retired Engineer from CBS Television City. Jan is still working as a Los Angeles County District Attorney Bureau Chief. 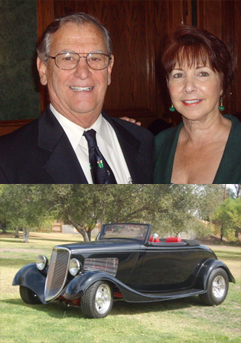 Carl enjoys repairing and restoring vintage radios, cars and spending time with family. What it means to be a member of the L. A. Roadsters: Very proud to be a member of such an elite car club. They look forward to many exciting adventures and hope to gain many new friendships.